Foreclosures • State A.G. seeks to intervene in case to preserve state's standing. Rick Egan | Tribune file photo "Foreclosures are personal, and foreclosure laws should be set by the state where the foreclosure is actually done," said Deputy Attorney General John Swallow. "We jealously guard our right to dictate how foreclosures work in Utah. I think they're dead wrong when they try to rule otherwise." A federal judge has ruled that Texas laws, and not those of Utah, govern foreclosures by a unit of Bank of America. The ruling by U.S. District Judge Ted Stewart is the second to go that way in federal courts in this state, and the Utah Attorney General's Office is asking to intervene to protect Utah's ability to set its own laws regarding foreclosures. Stewart handed down the decision this week in dismissing a proposed class-action lawsuit against BofA and its foreclosure arm, ReconTrust, as well as an attorney who performs the foreclosures in Utah for the bank. Stewart adopted the reasoning of Judge David Sam, who reached the same conclusion in a ruling handed down in December. 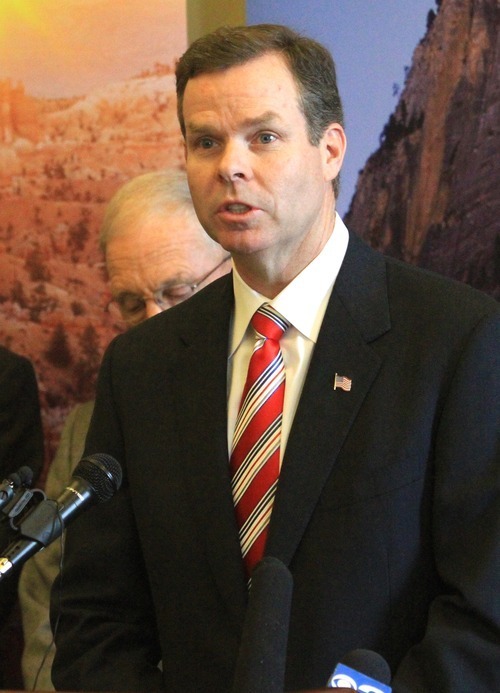 But Deputy Utah Attorney General John Swallow said his office intends to defend the state law that says only Utah attorneys and title companies with offices in the state can act as a trustee and foreclose on property. Stewart held that ReconTrust performs its duties related to foreclosures in Texas, where it is headquartered. That means that under the National Bank Act that state's laws govern foreclosures in Utah, the judge wrote. "Foreclosures are personal, and foreclosure laws should be set by the state where the foreclosure is actually done," Swallow said. "We jealously guard our right to dictate how foreclosures work in Utah. I think they're dead wrong when they try to rule otherwise." Sam has yet to rule on the state's pending motion to intervene in the case before him. The request is being opposed by ReconTrust. Marcus Mumford, an attorney for the homeowners who sued, said he was disappointed. State laws that allow foreclosures to be handled outside of courts are a privilege that banks are abusing, he said. "The federal judge in our case is now giving banks the permission to ignore Utah law," Mumford said in an email. "The court is saying that banks can abuse the 'privilege' of nonjudicial foreclosure in Utah by picking and choosing among the provisions of Texas law that make the non-judicial foreclosure process more efficient for the banks." The state previously intervened in another Utah case in which Judge Clark Waddoups found that state law governed ReconTrust in foreclosure proceedings. But that case ended up being dismissed by the homeowner. Judge Dee Benson has made similar findings to those of Waddoups in another lawsuit naming ReconTrust. The opposing decisions mean the 10th Circuit Court of Appeals in Denver probably will have to provide a definitive ruling. Last year, the Attorney General's Office threatened to sue Bank of America over the issue of whether ReconTrust was legally foreclosing on thousands of homes in Utah. As a result, the company in August halted foreclosures under its name and instead now hires a Utah attorney to do so. At the same time, ReconTrust attorneys have continued to argue in courts that it has the right to foreclose in its own name. Attorneys who represented the company in the case before Stewart did not return an email seeking comment.